As the anchor of the Iberian Peninsula, Spain has long been home to a thriving cultural variety. From the Catalan language to island life in Ibiza or the Canary Islands, all of Spain is an icon of European grace and elegance. When we think of the country, it culls up the bright red of the matador's coat or the sublime facade of Madrid's city hall behind the world-famous fountain in the Plaza de Cibeles. Spain brings to mind a turbulent and impassioned history, the great armada, the modern skyline of Barcelona's financial district, the distinct cubism of Pablo Picasso and the dark vistas and beautiful, romantic nightmares of Francisco Goya. There is the white-capped border of the Pyrenees and the striking blue of the Mediterranean where it exchanges waters with the Atlantic. Spain is all of these things and more. Imagine then if the entirety of a country could be encapsulated in a design. DecorPlanet.com is now proud to carry the Fresca Platinum line of bathroom products, inspired by and produced in Spain. Each one of the Fresca Platinum Bathroom Vanities is handcrafted in Spain using only the finest materials. Featuring slow-closing Hettich hinges and crystal drawer and cabinet handles by Swarovski, these are among the most beautiful and striking vanities available. Distinctly European, and taking décor touches from as wide as Vienna and Paris, these vanities embody the at once distinct and shared quality of Spain's own historic architecture and design. The vanities come in heights between 24 and 47 inches, with widths up to 47.75 inches in the modern style. Go for variety with your vanity and equip it with LED lighting systems in the mirror and real leather and solid wood cabinets. These cabinets are of a unique quality and design seldom seen in the United States. Let your bathroom transcend international boundaries. Paired with a variety of other bathroom accessories, from stylish shower panels to large and efficient storage cabinets in the modern style and sleek faucets, your Fresca Platinum Bathroom Vanity will come to vibrant life, and despite its fresh modern appearance, will maintain the age and European persona of its country of origin. 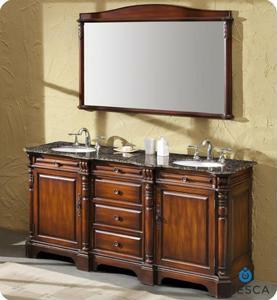 DecorPlanet.com is happy to provide these gorgeous vanities to customers, so why not be happy to furnish your home with one? Give your bathroom a touch of continental charm.